louellen (RIYL: The National, Elliott Smith, Interpol) are an indie rock band hailing from South-East England comprised of Christian Corless (Vocals, Guitars), Richard Picot (Guitars, Vocals), Harry Thomas (Bass) and Joss Pennington (Drums). louellen layers intricate guitar melodies with dark, driving vocals and drums to create a broody, yet beautiful sound. The band is currently busy recording their debut EP at The Dairy in Brixton, London. We had a chance to talk to Christian and Richard, the founding members of the band. Could you please state your names and what you do in the band? Christian, I play guitar and sing. I’m Richard, I also play guitar. How did you guys meet and form the band? Did you know each other before forming? Christian: I’ve known Harry and Richard for years. I met Joss (Drums) a couple of years ago through Richard in Huddersfield, where he was going to university, but only really got to know him when he joined the band. It’s kind of a weird situation as far the formation of the band; Richard and I have been writing songs and playing around with ideas for a 2 years or so. At first, for lack of any other choice, we performed the songs using a laptop for the drum track etc. We wanted Joss to join the band for a while, so when he finally offered up his services we were more than happy to get him on board, that’s when the band was properly formed, I guess. Richard: Christian and I met a few years back who also introduced me to Harry (Bass). At that point we were all kind of doing different things, I was doing a singer/songwriter thing and playing some local shows with that. I had some extra guitar parts I needed playing, so Christian helped me out with that occasionally. We always shared the same tastes and ideas in music and what I was doing wasn’t really cutting it for me. So we made a band and got friends to help out with drums but it never really came into it’s own. I went away to university where I met Joss, and that was it, we asked if he would be interested in joining the band and thankfully, he agreed. At what point in your lives did each of you realize that a career in music was what you wanted to pursue? Christian: When I got my first guitar at 13, I didn’t really want to do anything else. A lot has changed since then but my ideas have stayed the same. Richard: I would say my story is similar; I got my first guitar when I was 11, played in a few bands doing covers and writing awful songs. From then, no matter how mundane it was, I knew it was something that would stick with me. Could you briefly describe your song writing process? Christian: For most cases our songs stem from songs/ideas I come up with just using basic chord structures…etc. Then I present the idea to the band, usually I record it and send it over to Richard and Joss to mull it over for a bit, so they can say what direction they think the song should go in and offer some input. From then it becomes a pretty collaborative process. Richard and Joss flesh out the songs and provide their creative/musical input. We’re all usually on the same wavelength and know where we want to take the song. We usually all have a particular concept in mind. So it works out pretty well. We don’t stick to a particular routine, but the process tends to naturally stay the same. Richard: That’s pretty much it. Since Joss joined it has made things a lot easier and the end results better, not just because we have another creative mind to work with but before hand it was just Christian and I trying to think of everything at once. Guitars, Bass, Drums, Keys etc. which is so hard to stem out when all you have is two really rough guitar parts. It’s a mutual thing, the drums should inspire the guitars as well as the other way around which was always a hard thing to do. Now it all just comes together the way it should. The rough mix of Lyre Bird posted for mailing list subscribers, for instance, is very complex musically and features angsty, brooding lyrics. What or who would you say influences your style most? Christian: We all have quite a range of influences from Sonic Youth to Neil Young to Fugazi. Richard’s really into his constructive use of drones and feedback. Lyrically, I don’t really have any specific influences other than personal experience. I dabble in poetry every now and then but couldn’t pin point any particular influence. We are influenced by bands strategies as well as their music i.e. ; we admire Fugazi for their D.I.Y approach to the scene and how they created a mass following without putting themselves out there to much. I hear ideas on songs and get inspired by them, but we never sit down and say “ok, let’s write a song like so and so”. Richard: I totally agree. We all share the same kind of taste, which we just draw on without knowing and luckily, because we are into the same kind of thing we are all really happy with what comes out. In about a year’s time, where do you expect to see yourselves? Any big plans? Christian: Just to keep progressing and making music, we’d like to play some festivals over the summer. Richard: Our debut EP should be out soon, hopefully early next year. That’s what we are really pushing for at the moment. It’s coming together really nicely. Other than that just to keep at it and just see where it takes us. What has been your favorite experience as a band so far? Christian: Just hearing songs develop and take their twists when they come together in a band/recording scenario. Richard: I can’t really put my finger on that, I would say it’s a broad thing like Christian has mentioned. Leaving after a day of working on a song, whether it’s mixing, recording or writing and hearing the whole thing come together is great. What’s your favorite thing about playing music? Christian: As above for me. Richard: I can’t say. Playing, writing, recording, I love it all. What would your dream show be, assuming that you can play with any band at any venue? Christian: I’d love to have played with The Velvet Underground during the factory years. The whole visual art and music crossover really appeals to me. As far as venues, it would be cool to play at the Royal Festival Hall. It has a really cool vibe in there. Richard: Ditto. I would also love to play a show with Sonic Youth. Thank you for taking the time to speak with us. Any last words? Christian: I don’t, but Mikey from Art Brut, would like to say “‘ello mate”. Thanks. Richard: Hopefully see you at one of our shows soon. Cheers. 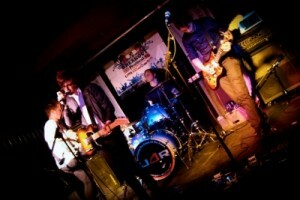 louellen are currently recording their debut EP and working with 7Ravens. The band will play a free Halloween show at The World’s End, Finsbury Park, London on Saturday October the 30th. Check their Myspace for more details as well as their songs at http://www.myspace.com/louellenuk or follow them on Twitter @louellenuk. Motion City Soundtrack Off Columbia? Listen: Battle Lines - "Colonies"